There are about 2,000 species of sea stars all over our oceans, found living anywhere from tropical coral reefs to the arctic seafloor. Here in central California, two of our most common species of sea stars are the bat star, Patriria miniata, and the ochre star, Pisaster ochraceus. A key identifier when it comes to bat stars is the webbing that is found between each arm. In fact, this webbing between arms is actually how bat stars got their name – scientists found it similar to the webbed wings of bats! 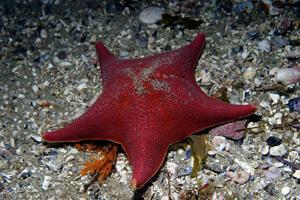 Bat stars are the scavengers of the ocean floor, feeding upon dead plant and animal material. This scavenging can get pretty messy, so bat stars have formed a symbiotic (aka mutually beneficial) relationship with certain segmented worms, or annelids. In this win win situation, the worms are able to get a full meal by grazing on the food scraps or even parasites found on the bat stars, while the bat stars benefit by getting cleaned. In some cases, upwards of almost 20 worms have been found living on one bat star. While bat stars are scavenging for food, they sometimes bump into each other. This sometimes turns into a "fight" where two bat stars have an arm wrestling competition! Ochre stars are extremely important along the California coast because they serve as keystone species. Keystone species are those that maintain the balance within an ecosystem, especially in regards to its food chain. Kelp forests are the quintessential marine ecosystem along the central California coast. Because kelp is found on the bottom of the food chain, many invertebrates, such as mussels and sea urchins, love grazing on it. Ochre stars keep the balance within our kelp forests by regularly feeding upon mussels - that way the mussel population does not get out of control. Sea stars have a number of crazy features that allows them to be the true stars of the ocean. These marine creatures fall under the invertebrate phylum echinodermata, which translates to “spiny skin.” All echinoderms posses a number of common characteristics including a water vascular system, pentaradial symmetry, and some form of regeneration. What are these confusingly named characteristics and how do they help a sea star? A water vascular system consists of a network of channels that extend through each arm of a sea star. Each of these channels subsequently leads to a tube foot. These tube feet allow sea stars to harness their inner spider man, allowing them to crawl and stick themselves on almost any surface. Pentaradial symmetry means that sea stars will follows a pattern in which they branch out into five (or multiples of five) distinct arms from a central point (the central disc of a sea star). Sea stars are able to regenerate, or regrow, their arms by hosting most of their vital organism in their arms. Could you imagine if we could do this with our arms?!? Sea stars also have eyespots at the end of each arm! These eyespots are not very advanced, as they are unable to see much (or any) detail or color. Instead they use these eyespots to determine the amount, or lack, or light in an area. Another unique characteristic of sea stars is that they also possess small pincer like structures called pedicellaria on their skin. Each pedicellariae has its own set of muscles and sensory receptors, which allows them to respond to stimulus. If unwanted particles, like sand, were to land on the sea star, they would be able to use their pedicellaria to push the sand off. Also, if they were to ever get any food scraps stuck on their arms they could use the pedicellaria to transport food towards their mouth. Check out this video to see some pedicellaria in action!